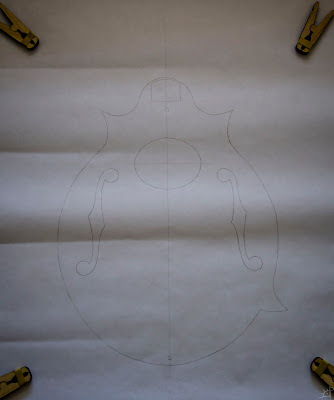 Preparing the sides for this project is the first order of business and the first real glimpse of progress after so much planning and redesigning. 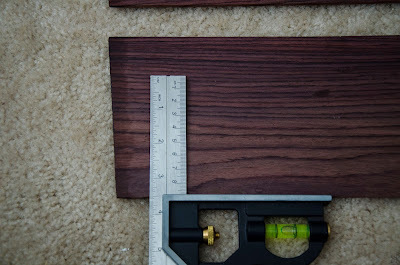 I have a pair of book matched Bolivian Rosewood sides that are about 4mm thick and wider than I need. Since I expected to have some levelling and plane adjustments to make after getting the sides put together, I left them a little wide. 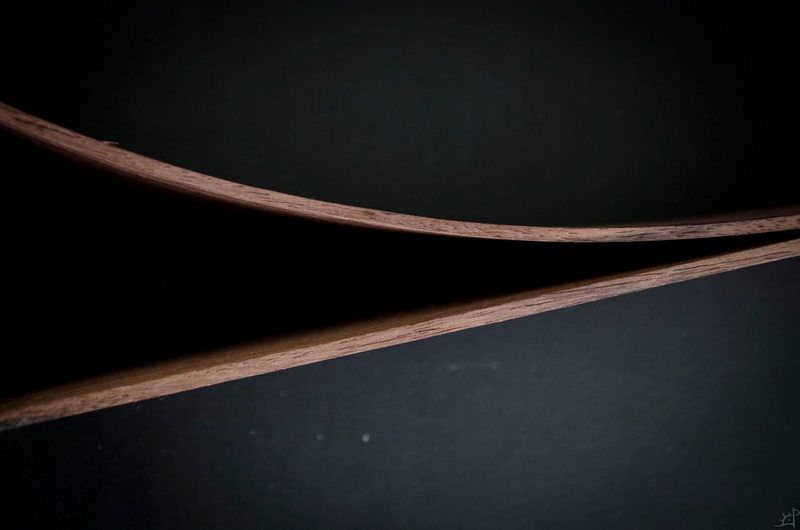 Because of the shape, each side cannot be one continuous piece of wood, but at the corners I want to preserve the grain alignment as closely as possible. Out of wherever these were milled and resawn into the pair, the ends are not even close to square. For now, I left that alone but ripped them down to about 9cm. Since I expected to have some levelling and plane adjustments to make after getting the sides put together, I left them a little wide. In the end, they will be about 8cm tall. And now we begin the steam bending. Here the first piece (longer part of the left side in the plan above) is in the steam box I built a while back. 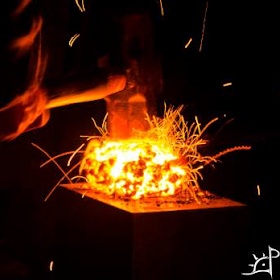 A rule of thumb is steam for an hour for every inch of thickness. This is very thin, so I put it in for a bit longer at 15min. 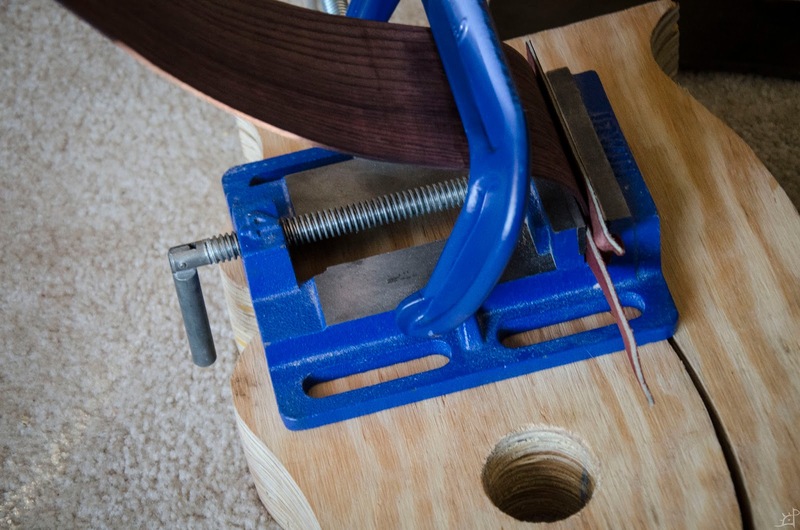 Before entering the box, I wetted the surface slightly to help saturate the wood and encourage good bending. Taking it out as quickly as possible, I set it in the press and clamped down as tightly as I could manage, using a length of pipe for extra torque on the screw. 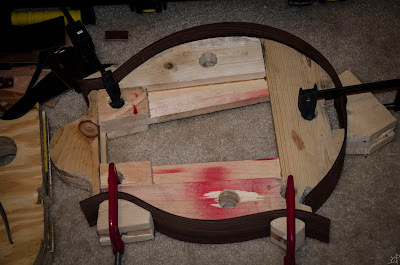 A day later, I undid the press, and you can see that only about 80% of the bend took set in the wood. You can also see that the grain started lifting on the tight bend on the edges where it was not quite supported by the frame. This is, although annoying, not that bad as I will be trimming these down anyway. It did, however, serve as a warning to the limits of the wood which I push later on. To get the last bit of bend out of the wood, I pulled the pipe from the box and turned my rusty old kettle into a steam gun. 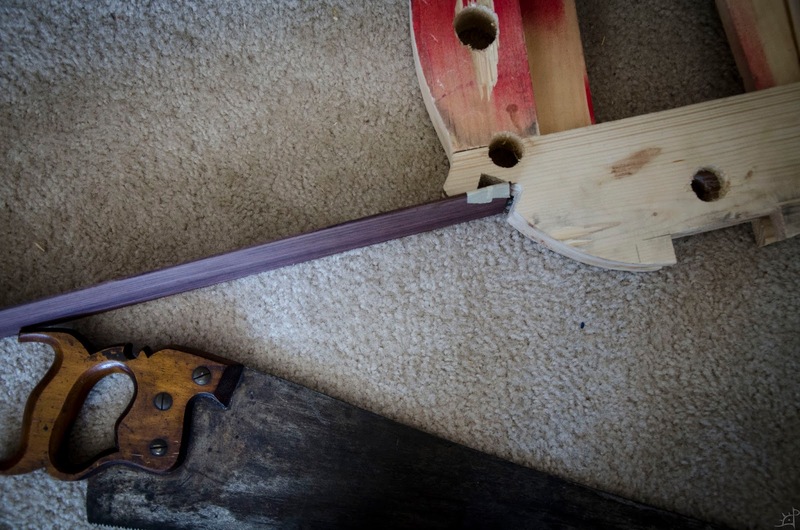 At this point, I had been bending this piece of wood for a few weeks and was ready to do literally anything to get the wood to stay bent. 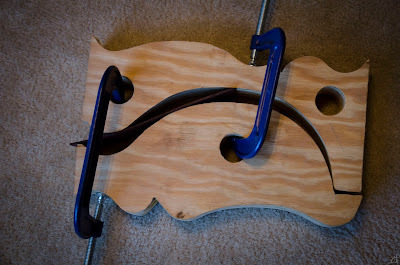 Scratching my head and beating it against the wall, I let the project sit for a few days when I was out of town. 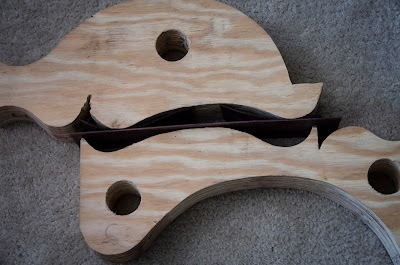 On the trip, I talked with a friend who is a professional luthier and he suggested I try a hot pipe to bend the wood around. Having never heard of that, I was absolutely willing to give it a try. 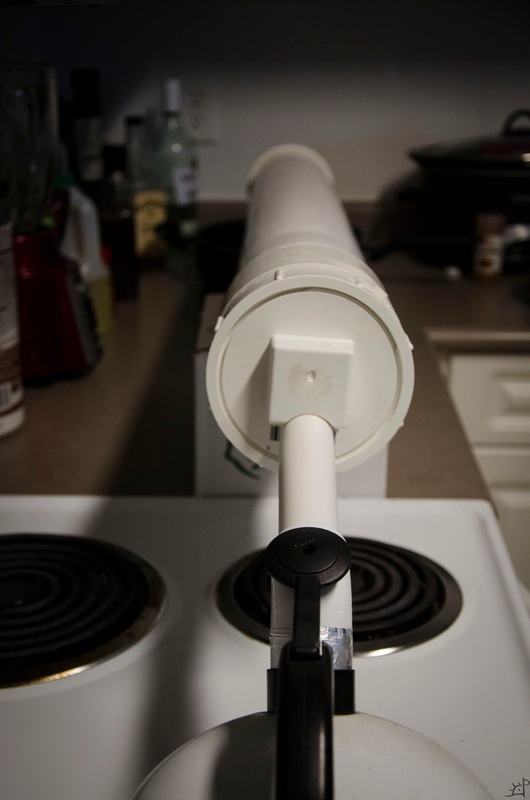 Apparently, this is a common method used in undeveloped countries who do not have access to a purpose made heated mandrel. All I had to do was heat the pipe (but not so hot that it burns the wood) and bend the wet wood around it. The pipe will boil the water and force steam into the wood, helping it both bend without breaking and take the set that is forced into it without it later relaxing. For this, the pipe I had on hand was a bit tight of a diameter, but I later found a larger pipe that worked perfectly. Had I known about this from the beginning, I would not have ever bothered making the second press frame. The pipe got the wood very close. 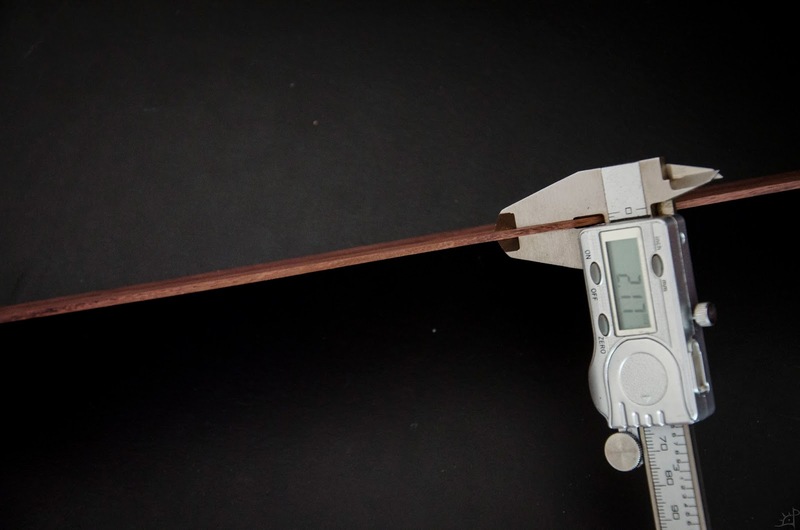 One thing, however, was the ends were extremely difficult to bend without something to either clamp against the pipe or push onto it with sufficient pressure to bend the free ends. 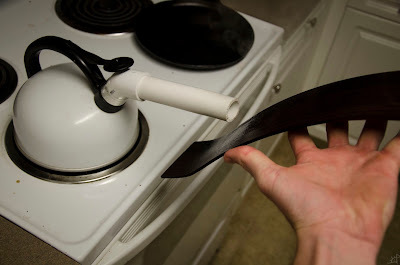 At the expense of burning myself a few times, I eventually stopped trying that and looked for another improvised solution. 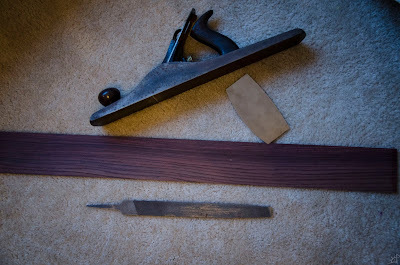 Had the wood been longer, it would not have been a problem as I would have cut the non bent length off, but that was not an option. 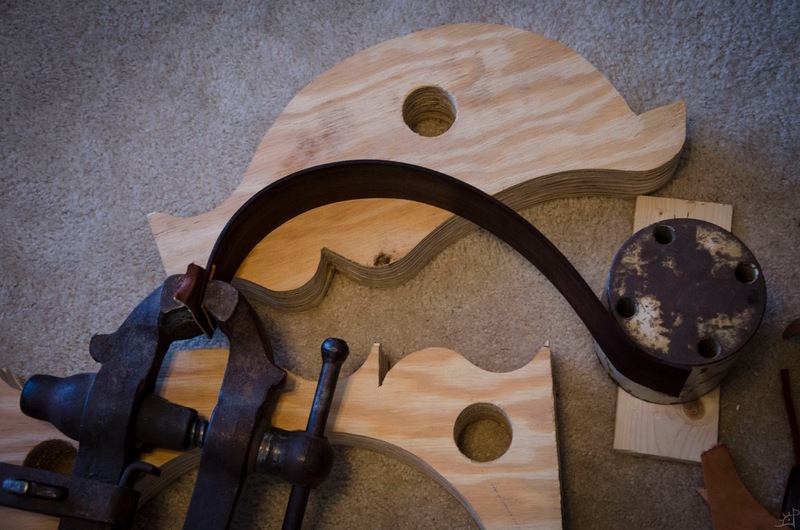 end in that, using weights and braces to force the wood into submission. 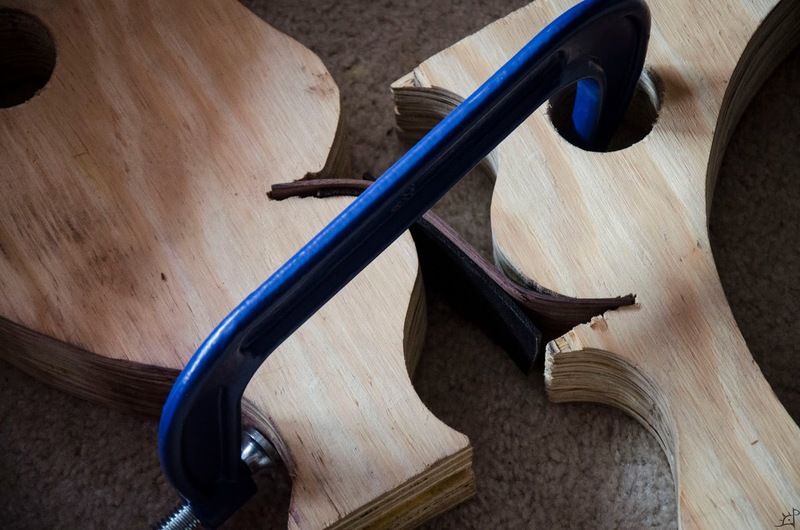 Craftsmanship is, as I see it, nothing more than persistence overcoming failure and the ability to creatively solve problems while starting with an educated guess at the solution. Just as I finished the first bend, I realized I had to do something differently. 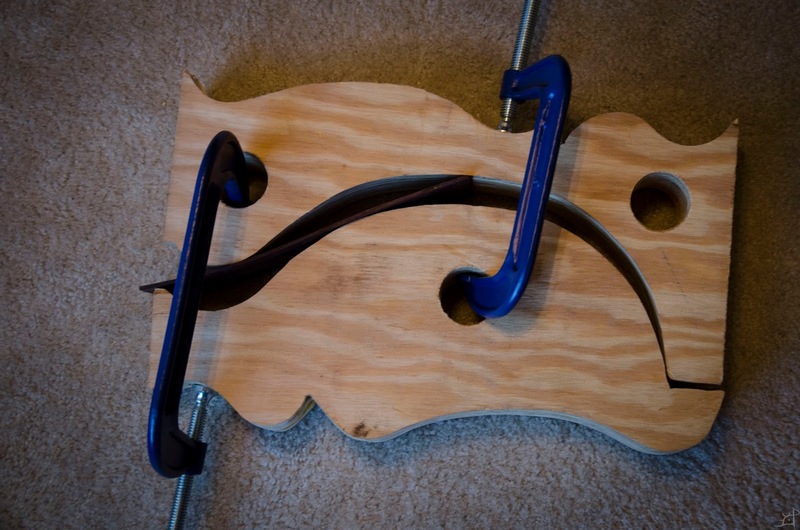 There was no way I was willing to take five weeks to bend each of the six pieces. At that rate, I would never finish. When I solicited help, I was told how thick sides of acoustic guitars are ordinarily. 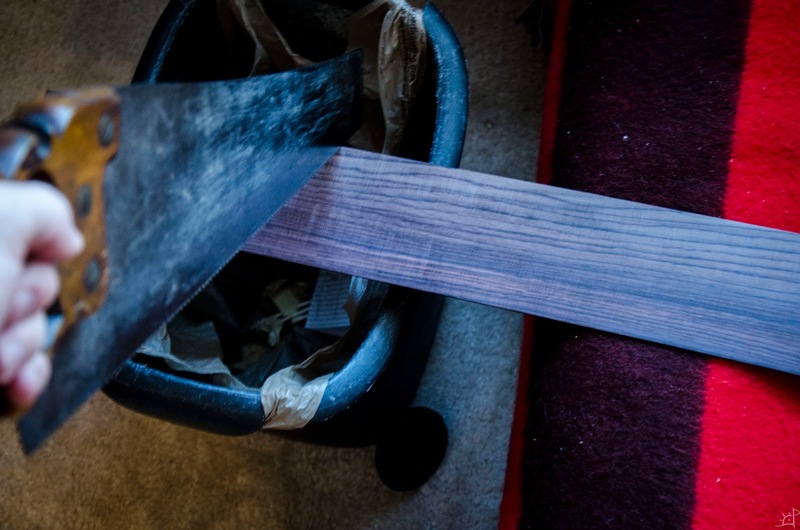 Having never made one or even played one before, I had virtually no idea and assumed that the wood (which came from a luthier's supply) would be close enough that I did not absolutely need to take it any thinner. That was wildly wrong. 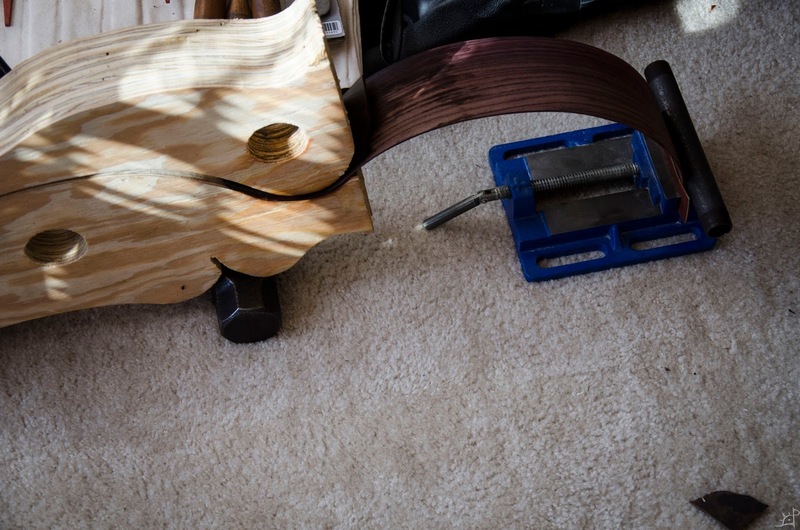 I suppose that my initial reluctance to thin the wood was my lack of workspace. 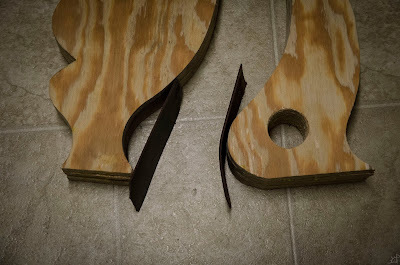 I did surface the sides before bending, but they were still about twice as thick as they needed to be. So, with a bit of annoyance at myself for not doing it earlier and at trying to do this without a workbench, I set to work. Between the joiner plane, files, and a card scraper, I managed to take the sides from 4mm to just over 2mm. This would not only make the wood easier to bend on its own, but would also allow the steam to do its magic more easily and leave a smaller discrepancy between the tension and compression surfaces of the bend for grain to lift. Half way to the needed thickness. The top one is the thinned, bottom the original. Final thickness. Making it consistently thick across the 9cm width by hand was difficult, especially the thinner it became. 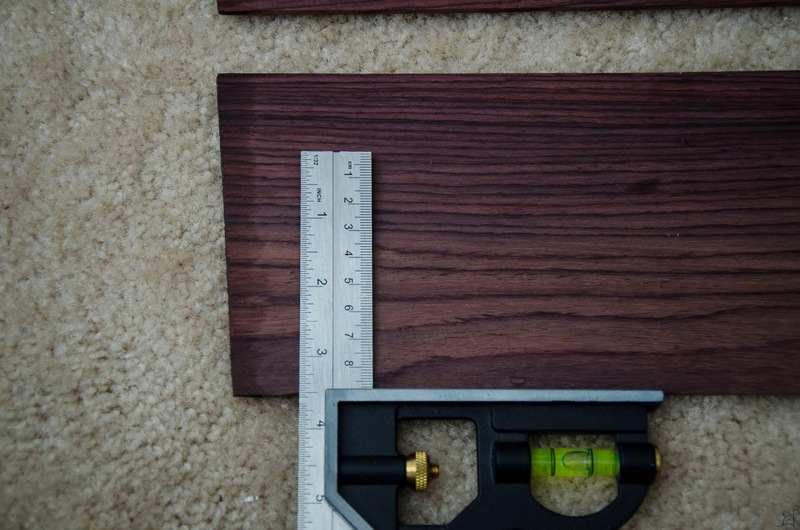 In the end, it was an average of ,05mm variation across the entire width and length, which was close enough for me. Eventually, after what felt like an eternity battling this thing, I moved onto the second piece of the side. This one is for the top left that has the recurve. 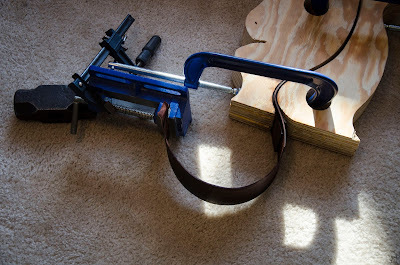 I figured it would be easier to bend it half way and then move to the other shape of the press instead of forcing the opposing curves straight off. The new piece is on the bottom of the above picture, and took almost no set. 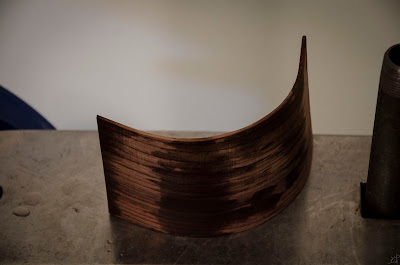 For retrospectively obvious reasons, the first curve unbent in the steam as I bent the second, leaving one curve instead of two. At this point, the extreme radius of the curve started splintering the outside grain, so I stopped there to reconsider the overall design. In the end I decided that I would use the neck brace block as the outer wood for the top rather than trying to force the rosewood into place and likely breaking it beyond use and repair. By now, I more or less totally abandoned the press as it was originally designed. Trying to wrestle opposing curves in one pressing operation was not working, so I used the one corner of the press from the original piece to bend virtually everything. Here, I also added two pieces of leather between the press halves and the side. 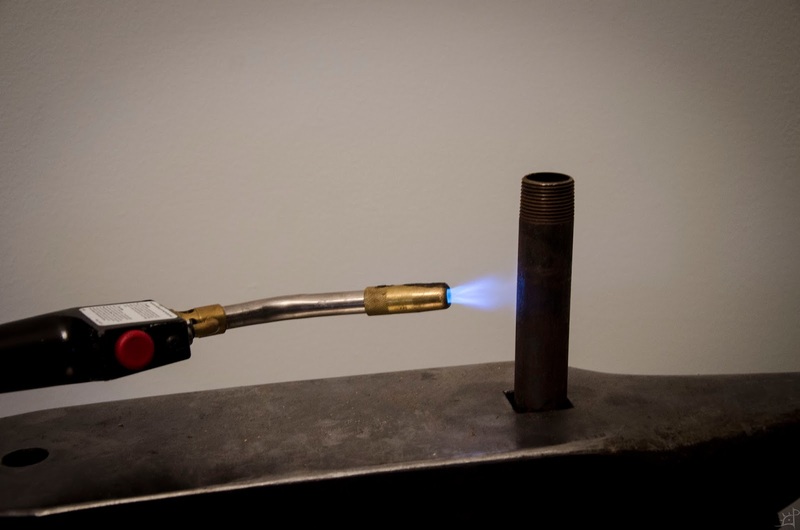 These both helped distribute clamping pressure, retained heat, and kept the moisture from dissipating too quickly. That combination was enough to prevent most of the damage I had experienced up to this point. Now that the first half of the sides is done, time to move to the second. 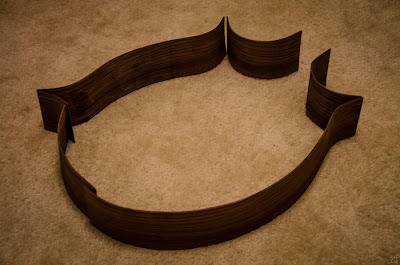 This one is more complicated and has two more pieces and one additional corner to deal with. 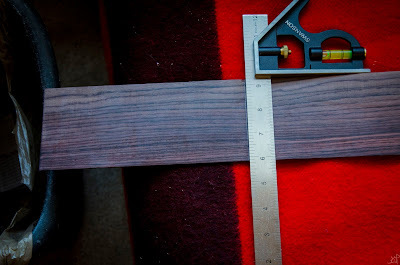 For the first of four pieces, I measured and marked square. This one, as with the others, leaves about an inch of extra material to accommodate the bend and potential splintering. Back to my trusty saw horse. Cutting wood only 2mm thick was difficult in this configuration to say the least. After this first cut, I did the rest with a knife and straight edge, which was faster and cleaner. Next up is the small piece that serves as the double corner. 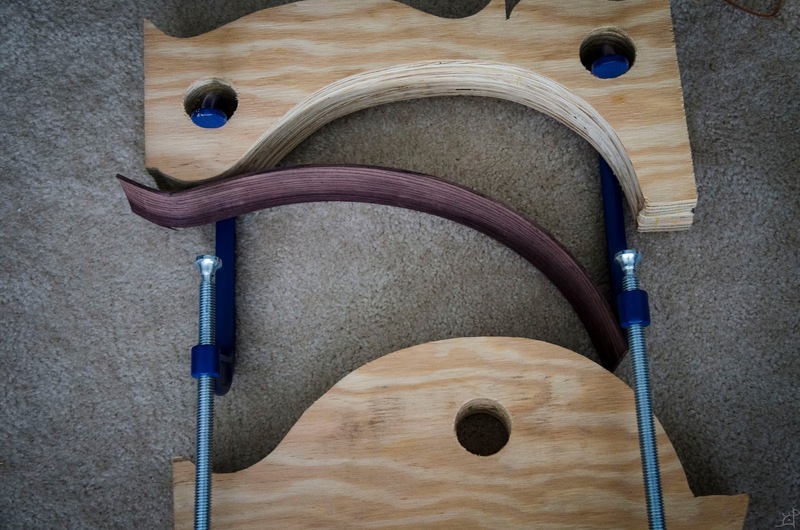 I was worried that the piece, being so short, would break along the grain while bending. 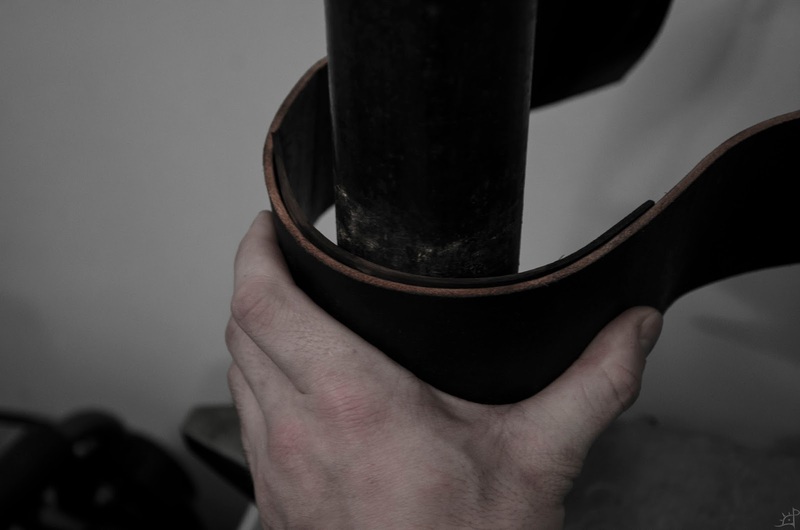 Fortunately, the leather served its purpose and it bent without incident. Third is the three curve piece. This one was particularly tricky. 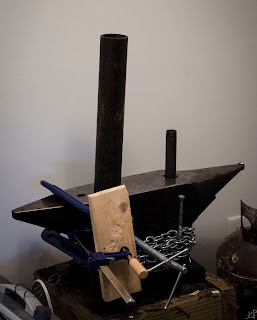 Had the wood been inherently more flexible, I would have been able to use the press as shown above, but it was not so I could not. S it was back to that one corner to set the outer bends. Again, as with the pipe, it was troublesome to have the bend carry all the way through the end of the side, so I had to start improvising again. 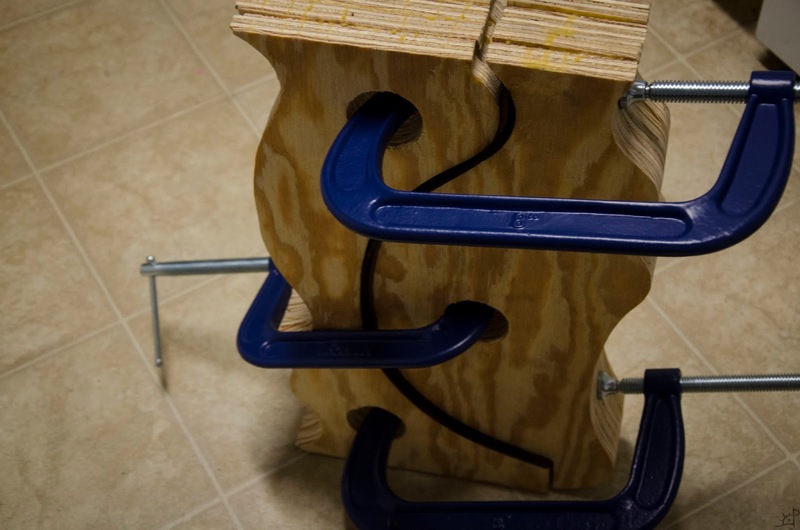 It's a wonder how many configurations you can manage out of a few simple clamps and vices. Every bit of extra weight and spacing makes a significant difference in the end result. 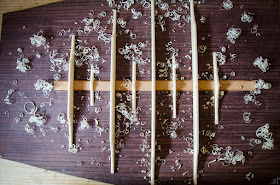 If you take it slow and use all the steam at your disposal, the wood will eventually bend however far you need it to go. Outside the press, it takes a bit more overbending to keep the set you need because there is no pressure to help submit the grain. I thought I had learned my lesson with the two top pieces, but with the success of the pipe and the other stuff, I found my confidence again. Or rather, over confidence. This bend did not work and nearly ruined me a second time. So it was back to the pipes. This time I had the larger pipe to serve as the primary bending curve, and the smaller one for tightening up the fine radii. Using a scrap bit of chrome tanned leather (nasty! Glad I held onto it though...) as a buffer from the hot pipe and steam, I slowly worked the wood to shape. 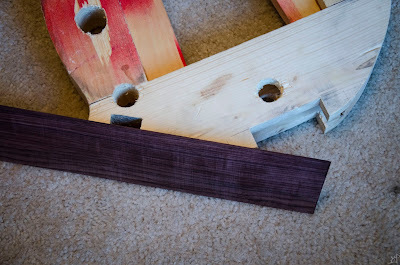 These are the top pieces that meet the neck, and I stuck with the decision to not have the recurve this time for good. Unlike the press and steam box approach, the wood takes its set and remains there almost immediately. 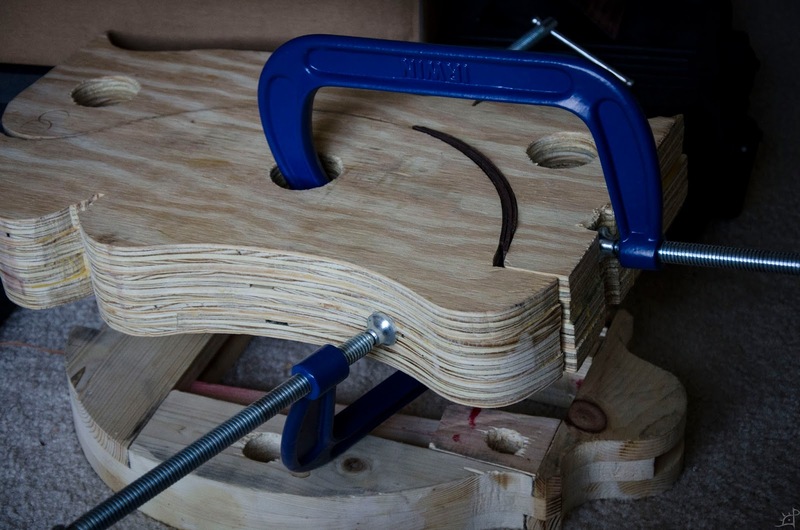 There is no need to keep it clamped or tied. It is what it is, once it is dry. And finally, here are the six pieces of the sides. 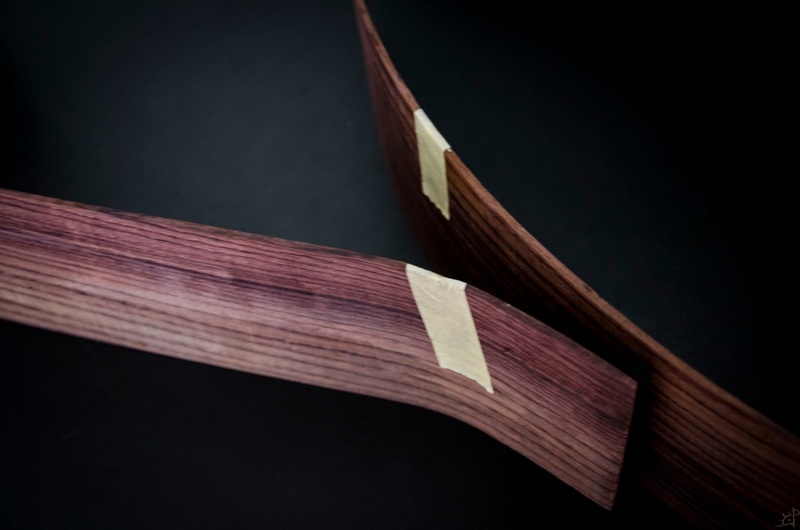 There is a slight amount of bending that will be tightened up in assembly, but not more than a few millimetres. Next up, trimming the final lengths and fixing them together.